Yarn and Fiber Happenings: New Gnome Kits and Prism Symphony and Merino Mia Yarns have Arrived! 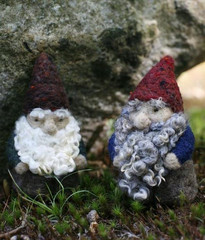 New Gnome Kits and Prism Symphony and Merino Mia Yarns have Arrived! Prism Yarns has shipped us new and beautiful yarns that you will love! 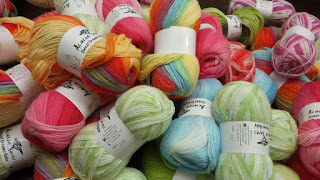 The dreamy Symphony Yarn and the luscious Merino Mia have arrived! Check out the new colors online or come and see for yourself in the store! Prism Symphony Yarn has lovely stitch definition, the hand is springy, soft and silky, the cashmere adds a touch of luxury and color saturation is excellent. Each 50 gram skein has 118 yards (108 m) of 80% Superwash Merino Wool, 10% Cashmere, 10% Nylon fiber that knits to a gauge of 20 sts = 4 inches on US #6 needles. Prism Merino Mia is beautifully twisted, soft, easy to knit, has a lovely sheen and takes Prisms vibrant, clear colors extremly well. 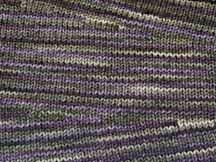 Each 100% Superwash Merino Wool skein has 190 yards (175 m) and knits to 24 - 26 sts = 4 inches (10 cm) on a US 3 - 4 needle. 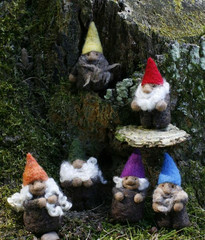 The Gnomes are restocked and they are wonderful! New items include St. Nicholas Gnome and cute foxes! We have kits for big gnomes, small gnomes, mini gnomes and things that you would find with a gnome, like mushrooms, cute owls and flocks of sheep. Each kit contains the necessary felting materials, detailed instruction sheet and felting needles to complete your project. Very cool! Also, newly back on the shelf, Plymouths Yarns Mushishi and Gina! All your favorite colors are here to start gorgeous garments! Have a Fiberlicious Day and Happy Fibering!